Progress from sea-water to early oil-lubricated stern tubes involved an exchange of the wooden bearing in its bronze sleeve for a white metal lined cast iron (or sometimes bronze) bush. Oil retention and exclusion of sea water necessitated the fitting of an external face type seal. The stuffing box was retained in many early oil-lubricated stern tubes, at the inboard end. In oil-lubricated bearings the shaft does not require a full length protective bronze sleeve. The later designs of oil-lubricated stern tube (Figure 8.15) are fitted in a stern frame with an elongated boss to provide better support for the white metal lined bearing. A minimum bearing length of two times shaft diameter will ensure that bearing load does not exceed 0.8 N/mm2 (116 lbf/in2). The bearing bush is normally grey or nodular cast iron centrifugally lined with white metal. A typical analysis of white metal would be 3% copper, 7.5% antimony and the remainder tin. White metal thicknesses vary according to the classification society. Figures of 3.8 mm for a shaft of 300 mm diameter to 7.4 mm for a 900mm diameter shaft have been quoted, with bearing clearances of 0.51-0.63 mm and 1.53-1.89 mm respectively. The forward part of the stern tube is fabricated and welded direct to the extension of the stern frame boss and into the aft peak bulkhead. Oil pressure within the stern tube is maintained at approximately the same level as that of the surrounding sea water by a header tank. Oil is contained within the Simplex type stem tube by lip seals. The elastic lip of each nitrile rubber seal, grips a rubbing surface provided by short chrome steel liners at outboard and inboard ends of the steel propeller shaft. The outboard liner additionally protects the steel shaft from sea-water contact and corrosion. Heat produced by the friction will result in hardening and loss of elasticity of the rubber, should temperature of the seal material exceed 110°C. Cooling at the outboard end is provided by the sea. Inboard seals, unlike those at the outboard end, cannot dissipate heat to the surrounding water. Oil circulation aided by convection, is arranged to maintain the low temperature of the seals at the inboard end. Connections for circulation, are fitted top and bottom between the two inboard seals and the small local header tank. The chrome liners act as rubbing surfaces for the rubber lip seals but grooving from frictional wear has been a problem. The difficulty has been overcome by using a ceramic filler for the groove or alternatively a distance piece to displace axially the seal and ring assembly. Allowance must be made for the relative movement of shaft and stern tube due to differential expansion. New seals are fitted by cutting and vulcanizing in position. The static lubrication system for vessels with moderate changes in draught, have header tanks placed 2—3 m above the maximum load waterline. The small differential pressure ensures that water is excluded. The cooling of simple stern tubes, necessitates keeping the aft peak water level at least 1 rrt above the stern tube. Tankers and other ships with large changes in draught, may be fitted with two oil header tanks (Figure 8,22) for either the fully loaded or ballast condition. The requirement for steaming at a slow, economical speed during periods of high fuel prices (or for other reasons) gives a lower fluid film or hydrodynamic pressure in stem tubes, due to the slower speed. 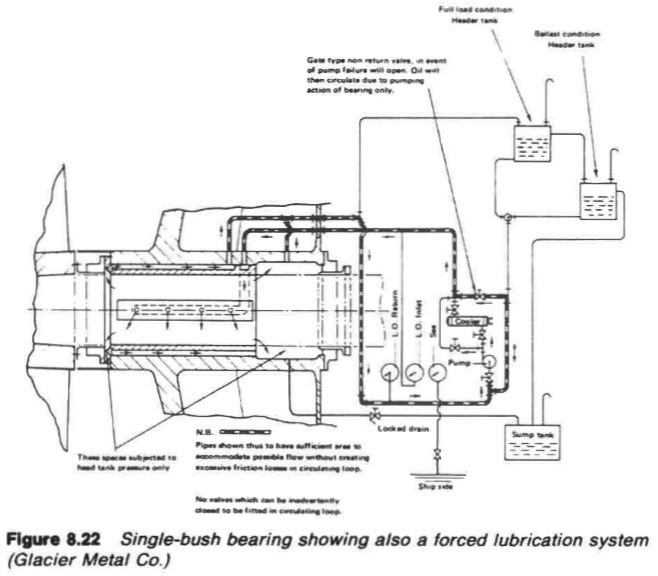 The possibility of bearing damage occurring prompted the installation of forced lubrication systems to provide a hydrostatic pressure which is independent of shaft speed. The supplied oil pressure gives adequate lift to separate shaft and bearing and an adequate oil flow for cooling.